All men crave respect, and husbands especially crave the respect of their wives. In fact, the Bible even commands wives to respect their husbands! You can find this instruction in Ephesians 5:33. 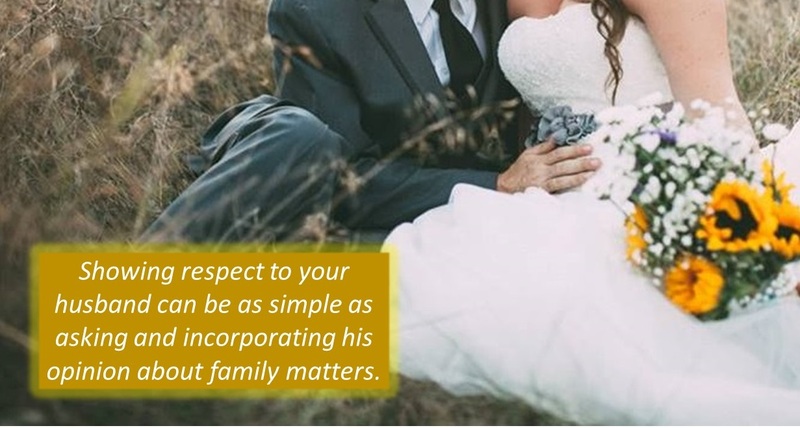 The question is: How can you offer respect to your husband in a meaningful way? Here is one way to show your husband honor and respect. Ask his opinion about how he would like things to go in your home and in your marriage relationship, listen attentively, and actually carry out his requests that are within reason. When you do this, you are showing him that he matters! You are also carrying out another instruction to wives found in Ephesians 5:22 where God says “Wives, submit to your husbands, as to the Lord”. Here are some examples of what I’m talking about. Have you asked your husband how he likes you to dress or fix your hair? Why not honor him by doing these things the way he likes? Have you asked your husband what’s most important to him when he walks through the door at the end of his workday? Would he like you and the kids to greet him at the door with kisses, or would he prefer to have 10 minutes of peace and quiet to unwind? Have you asked your husband how many activities he thinks is ideal for the children? Ask him, listen to his opinion, and begin incorporating his desires into your routine. This will communicate respect, and when he feels your respect, your whole marriage relationship will likely improve!